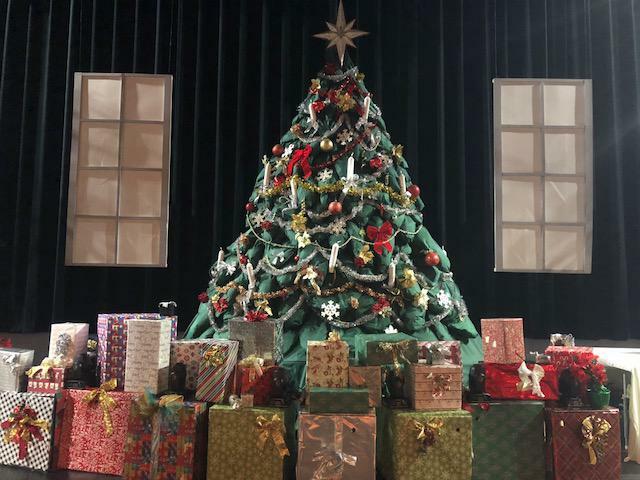 A Christmas tree in the Nutcracker set. The Nutcracker’s choreographer, Breezy Berryman, is giving directions to two dancers. “Take the time it takes to fulfill these movements!” she yells over the music. Berryman knows this dance well. In fact she knows every step. She’s been involved in the Nutcracker for a while. “Well, I could probably say it's taken up maybe almost half of my life,” she said. This year marks the thirtieth anniversary of Homer’s Nutcracker production. Berryman’s mother was the founding artistic director for the Nutcracker in 1988 and Berryman played one of the main characters, Clara, in the first production. “We were watching the video of the first [production] for Thanksgiving and we were all laughing about how I looked like I was scared on stage and looked pretty floppy in the lifts,” she said. Berryman continued to study dance after she moved away from Homer. But she came back to co-direct the production about eight years ago. Now, she’ll be directing her mother in the show this year. But that’s just one of the many ways the show has changed. Ken Castner is the producer of the Nutcracker, and he said when it first started, the crew had to make the entire set from scratch. “A lot of people helped but once we had all that stuff built then we kind of looked at one another and said, well we’ve got to do it again next year,” he said. When asked if he knew it was going to get this big, he said no. He’ll be on the sidelines this year, but he’s not the only one who has stuck around. Copeland-McKinney has volunteered with the show for about 29 years. She even pulled her family into helping out with it. If you look real close, you can still see her kid’s baby footprints in the background of some the painted sets. She said the biggest shifts came when the new artistic directors brought the show out of the eightieth century by adding modern dances such as a hip-hop battle scene. Jennifer Norton is a co-artistic director for the show. She took it over, along with Berryman in 2011, and she adds that they try to balance the old and new. The theme of this year is “Sleeping Beauty” but the show will also touch on the fact that it’s the thirtieth anniversary through the storyline. She said the show is a true community effort and gives kids opportunities they may not otherwise have. “There are kids who are really struggling at home or they don’t have opportunity for this kind of community and it’s really fun to see the kids who try out on a whim, they are unsure of what they're doing, they haven't danced before, and then to see them like completely fall in love with it,” she said. Norton said that’s just as rewarding as the kids that come ready to dance on day one. “It’s a really wonderful combination of those things: people who've never thought that it would be their home kind of come here and find a home here and then other kids who know exactly that this is the place that they should be,” she said. The Nutcracker runs until Sunday. Those looking to get into the Christmas spirit will be able to kick off the season this weekend with several performances of the Nutcracker. Over 75 young dancers and actors have been working on this year’s performance since August. Co-director Breezy Berryman is getting her dancers ready for the opening performance of the Nutcracker Saturday. Young kids to teenagers are working through the steps as Co-director Jennifer Norton and Berryman look on, making sure every last detail is perfect.